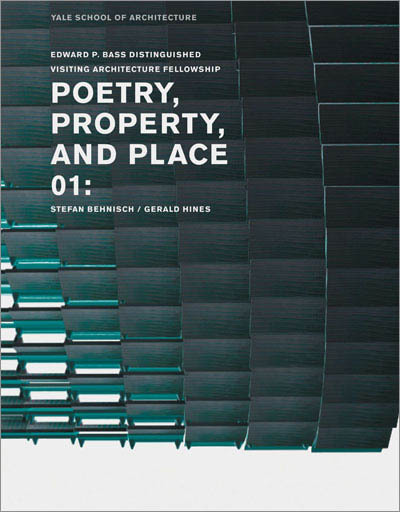 VOLUME 1: POETRY, PROPERTY, AND PLACE features Gerald Hines as the Bass Fellow with architect and Saarinen Visiting Professor, Stefan Behnisch. The students designed a museum of fashion for a site in Milan, Italy where Hines was working on a development project with a master plan by Cesar Pelli. VOLUMN 2: FUTURE-PROOFING features developer Stuart Lipton of London; architect and Davenport Visiting Professors Lord Richard Rogers with Chris Wise of Expedition Engineering; and Malcolm Smith of Arup. Yale Students designed a contemporary urban environment in Stratford City in East London, the site of the 2012 Olympics, as a new community around a new transit hub. The students were encouraged to provide environmental sustainable development in the master planning and individual building designs, as well as solutions for a future-proofing strategy of a minimum of 100 years, showing a robust thought process for sustainability and vital urban design. VOLUME 3: THE HUMAN CITY, KING"S CROSS CENTRAL with Roger Madelin of Argent Group LPC and Demetri Porphyrios will be published December 1, 2008. This book focuses on the King’s Cross site in London where Argent is planning a major mixed use development to the plan by Porphyrios and Allies & Morrison Architects.